Yesterday, I went to my mother’s for our weekly dinner together. It’s my treat, and we alternate between two of her favorite meals – McDonald’s and Subway. This time she chose McDonald’s. Not good for my diet, but certainly okay for my budget. I bought two McDoubles (boy, do I hate those silly names) and one small fries to share. Total: $3.39. My mother is a cheap date. Although we sit at her kitchen table to eat our cheap burgers, I usually dress up a little on the night I go over to Mom’s. I like to wear something special, including cool shoes and a pretty necklace or bracelet. And I make sure my hair and makeup look good. My mother is pleased if I look nice. I want her to think she raised me well – I’m a job done right. With my burgers nice and warm via the passenger side seat-warmer, when I stop at the light near her house I check my makeup in the visor mirror. I always look great in the car mirror. Every time I snap that visor down, this soft pretty image looks back at me. Even the side-view mirror. When my husband drives the convertible, and I catch a glimpse of myself in the side-view mirror – with the sun on me and the wind whipping my hair – I like what I see. What is it about car mirrors that give me such a good reflection? The natural lighting? No. I like my reflection at night too. Is there some kind of distortion? Maybe only being able to see a seven-inch band of your face is a flattering way to look at yourself. Certainly there are good mirrors and bad mirrors. The ladies’ room mirror at work is really bad. Unless I have had my color done the day before, I have an inch of gray roots. Which matches the gray shadows beneath my weirdly puffy eyes. And I don’t want to even think about the marionette lines from nose to mouth. I’ve warned my co-workers about that mirror. “Don’t look when you go in there,” I say. And speaking of trying stuff on at home, I shopped a long time for the full length mirror in my closet. I look good in that mirror. But not too good. I want to be able to fix myself before I leave the house. So if there are good mirrors and bad mirrors, how do I know what I really look like? Am I the tired wreck in the office ladies’ room? Or the radiant-skinned young beauty in the car? How do I know? Photos are no help. I point the camera at myself and click away. One photo is wretched, the next is wonderful. And I haven’t moved, except for my finger on the shutter. I do know one thing about photographs. Looking back at old pictures, I was a lot prettier and thinner than I thought I was. I’m sixty-one years old and I’ve just realized I don’t know what I look like. I think I will go with my mother’s opinion. She thinks I’m gorgeous. And a snappy dresser. This may be hard to believe, but it isn’t the mirror; it’s the lighting. Except for TJ Maxx… they buy their mirrors at the fun-house supply store. You have a passenger side seat warmer? I’ll remember this next winter. Toasty buns are very nice. I try never to catch myself in a mirror. I prefer to think I look like I did in my 20s. Beauty is in the eye of the beholder. 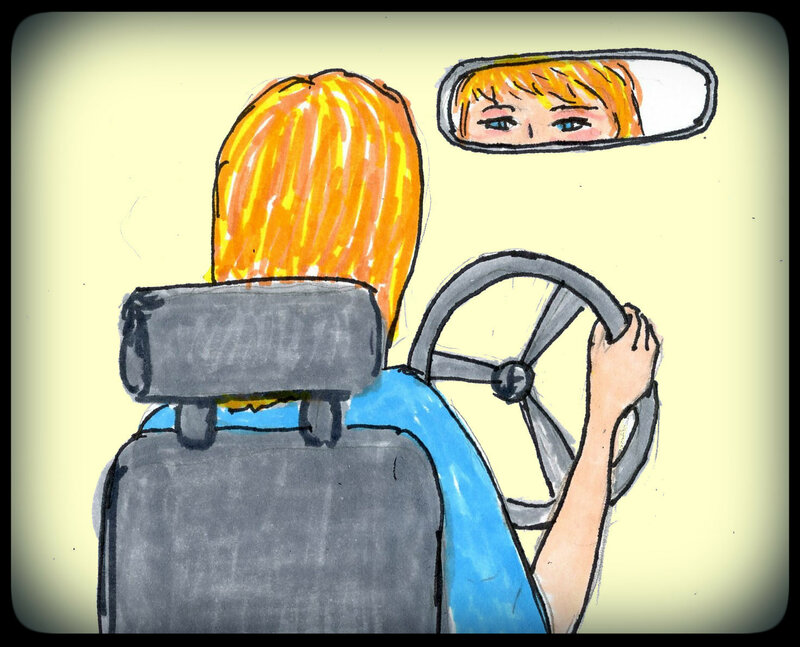 When you catch a glimpse of yourself in the convertible’s side view mirror, you are seeing yourself as the world sees you instead of the self-critical notice every flaw look we often use on ourselves when we gaze at our reflection. I also think our mood plays into how we look both to the outside world and to ourselves. When we are in a great mood, that shines through. Have you considered, perhaps you really are simply lovely. It isn’t mirrors it is you. I have a thin mirror in the bedroom. I keep trying to convince myself that IT is the accurate one. Sometimes it works! Now that I think of it, maybe I can just buy one of those TJ Maxx mirrors and live happily ever after. I’m much happier not knowing what I look like. I have a magnifying face mirror in the bathroom and that thing is scary. Sometimes it’s necessary but there is no way I would use it for anything but tweezing those bothersome hairs that seem to grow more places as you get older. Your story reminds me of “Tuesdays with Mom.” She loved diners so we almost always went to a diner. Great times and I miss her. I agree with Ray. It is all about the lighting and the lipstick. And the concealer. And not standing too close. And having a big smile on your face. And hold your stomach in. It’s hard not to shriek when you come upon a mirror unexpectedly. I always wonder who IS that old lady? I do way too much internet dating (any internet dating is too much, really) and I have noticed that MANY men take pictures of themselves while in their cars. I wonder if they are experiencing the glory/ delusion of the car mirror? Yes, there are definitely friendly and unfriendly mirrors. It’s amazing that I ever buy anything at all from Kohl’s, where the dressing rooms have fluorescent lights bright enough for an operating room. I always come home from Kohl’s ready to start a new diet and skin care regime. Grandma is very wise. If she thinks you look good, you look good. Love it! My mother at various times during a visit observed that I was tall (I’m 5-2), young (I was well into my 50s at the time) and bosomy (never in my wildest dreams). But to a tiny (4-11), saggy-breasted woman of 90 or so, I was all those things. Yup…one of the many reasons I love my 88=year-old mother. I agree about old photos. I look at pictures from my thirties and wonder why I spent the whole decade worried about my weight. I must have had a bad mirror. I feel your pain. There should be a law that all mirrors have to show your true reflection. Either, that, or our eyes should all be implanted with skinny view technology. Well, you must always remember that mothers know best. So, of course, she is right! Another good trick is to look up into a mirror, everything looks as it should. Warning – Do not ever look down into a mirror if you are over the age of 35 (especially if you haven’t had any work done). – I am not responsible for your subsequent actions if you look down…..
Of course your mother is right! Your mother, and the car mirror, and life is good! I love the magic car mirror. And my mother-in-law’s magic slimming mirrors. My mirrors at home are terribly cruel. ha! what kind of mirrors are at the swimsuit places? i swear i look WAY better in my undies at home than i did in a two piece at the store. Oh, don’t get me started about the sadistic Ugly Mirrors in my workplace. I like car mirrors, too, and soft, dim lighting is always the best! As for not knowing what we look like — I’ve been concerned because, when I take photos for the blog, only one out of every 10 is acceptable to me. This seems like a bad ratio! But here’s my new theory: we look better in “real life,” when we are moving and speaking and our expressions change from moment to moment. Cameras freeze one moment in time. That, in itself, is a distortion. I like your idea that we all look better in real life. But one out of 10 photos is excellent! For my last blog “about” picture, let’s just say I took more than one but less than 200. I love this post! First of all, my mother and I used to go out for McDonald’s every weekend when I was in my twenties. Pictures of me then look pretty darn good. Pictures of me now scare me to death. I have to believe they show what I actually look like. The distortions in the mirror fool me. Photographs seem more accurate. That’s why I avoid them. Some marketing person needs to get a clue about those mirrors in dressing rooms — they’re fluorescent, so turn your skin green(ish), show every flaw you really don’t want to be reminded of, and make everything that should be small look big, and everything that should be big look small. Who designed those dressing rooms, anyway?! You have to be wearing stage makeup, or the lighting makes you look like you’ve either been dead for a year, or you haven’t slept for a week… marketing missed big-time on this one. You’d think they’d know they’d sell way more stuff if they’d just fix the lighting in those dressing rooms . . . I think your mom is right. Such a blessing to have that time with her, too.